Building rail lines in America, the Ticket to Ride board game has some big, big predecessors to live up to. But Ticket to Ride is such a fantastic game that it quickly answers all your doubts with a resounding "Let's play it again!" From the top-notch production to the carefully balanced game play, Ticket to Ride is one of the best games ever from a domestic American publisher. In the year 1900, players are rushing around North America trying to connect as many cities as possible, and use their train tickets to connect far-flung cities. But the routes are limited so opponents can take that last bit of track you need to win the game! Ticket to Ride is so simple to learn that it's hard to write a summary without giving away all the goodies. The rulebook is just 4 pages long (including the illustrations)! But there's a great middle-weight game waiting in those simple rules. Hands down the best train game of the year, and a strong contender for the Spiel Des Jahres Best Game of 2004! Unless you're fatally allergic to train games, buy this game now! The summary of rules will be quick; the Ticket to Ride board game takes minutes to teach to a new player. You're playing on a board of America and Canada in the year 1900. The cities depicted are linked by tracks between 1 and 6 spaces long in one of 7 colors (or in the "non-color" of grey). You're going to cover these tracks with the cool plastic train models provided. You start Ticket to Ride with 4 train cards. These come in the same 7 colors at the tracks plus a rainbow-colored locomotive card that is "wild". These cards pay your way around the board. You also start with 3 "train tickets" (discard one if there's one you don't like). The train tickets list two cities far apart, and give points at the end of the game if you've connected them. But you deduct that many points from you total if you don't complete the connection! Draw cards- There are five face up train cards. Take 2 of them and replace from the face-down drawing deck (or just take from the deck if you don't like the face-up ones). Only excepetion is that if you take a face-up locomotive (wild) card, you don't take a second card. Claim a section- Pay cards in the number and color of the track (i.e. 4 blue cards, or 2 brown cards). A grey track can be bought with its number of cards in any one color. When you claim a section, give yourself points as per the helpful guide. Draw tickets- You draw three tickets and keep (at least) 1, 2 or 3 as you like. And that's almost all there is to it. The game ends when a player goes from their initial 45 plastic train models down to 2. Everyone gets one more turn, and you total up the points. Take the points you received from claiming tracks, and add any points from tickets you successfully completed. SUBTRACT points from tickets you failed to finish. And as a last bonus, the longest continuous track gets 10 points. You're ready to crown your winner! Who should buy Ticket to Ride? The Ticket to Ride board game has received almost unanimous rave reviews from the RDG team - and almost everyone else who has played it. With its simple rules and game time inside an hour, it's a great introductory game for beginners. But the actual level of the game will satisfy those of us with a taste for games. The Days of Wonder website quotes another reviewer, "You'll never play TransAmerica again." TransAmerica still has a place in our game rotation (kids and the 20 minute filler game), but we're sure not using it as an intro game anymore. Really, unless you're just totally unable to appreciate any train game (we have one of you at RDG) Ticket to Ride is a must have for your gaming closet. The fun, ease of play, replayability... Ticket to Ride is just great value for your gaming dollar. October 2, 1900 - 28 years to the day that noted London eccentric, Phileas Fogg accepted and then won a £20,000 bet that he could travel "Around the World in 80 Days". Now at the dawn of the century it was time for a new "impossible journey". Some old friends have gathered to celebrate Fogg's impetuous and lucrative gamble - and to propose a new wager of their own. With elegantly simple gameplay, Ticket to Ride can be learned in 3 minutes, yet players face strategic and tactical decisions that vary with every turn. Players collect cards of various types of train cars that are then used to claim railway routes connecting various cities across a map of North America. The longer the routes, the more points they earn. Additional points come to those who can fulfill Destination Tickets - goal cards that connect two distant cities; and also to the player who builds the longest continuous route. 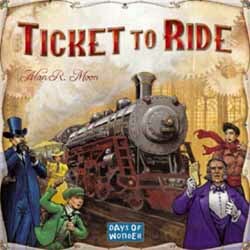 "The rules are simple enough to write on a train ticket - each turn you either draw more cards, claim a route or get more Destination Tickets", says Ticket to Ride author, Alan R. Moon. "The tension comes because you're forced to choose only one action - and of course you always want to do more than one! If you draw more cards, another player may claim a route that is critical to your success. If you claim a route of your own, you might miss out on some key cards." Ticket to Ride continues in the tradition of Days of Wonder's big format board games featuring high-quality illustrations and components including: an oversize board map of North America, 225 plastic train cars, 144 illustrated cards, and wooden scoring markers.